The following is a list of notable deaths in August 2016. Queen Anne of Romania was the wife of Michael I, former King of Romania. Frank Flores Blas, Sr. was a Guamanian politician, businessman and member of the Republican Party of Guam. Blas served as the Lieutenant Governor of Guam from 1987 until 1995 for two consecutive terms under Governor Joseph Franklin Ada. The Guamanian self-governing government consists of a locally elected Governor, Lieutenant Governor and a fifteen-member Legislature. The first popular election for Governor and Lieutenant Governor took place in 1970. The current Lieutenant Governor is Josh Tenorio, who has been in office since January 7, 2019. Terence Bayler was a New Zealand film, television, and stage actor. His most memorable roles were in Monty Python's Life of Brian (1979) and Harry Potter and the Philosopher's Stone (2001). Monty Python's Life of Brian, also known as Life of Brian, is a 1979 British comedy film starring and written by the comedy group Monty Python. It was also directed by Jones. The film tells the story of Brian Cohen, a young Jewish man who is born on the same day as—and next door to—Jesus Christ, and is subsequently mistaken for the Messiah. 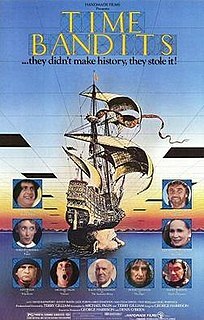 Time Bandits is a 1981 British fantasy film co-written, produced, and directed by Terry Gilliam and starring Sean Connery, John Cleese, Shelley Duvall, Ralph Richardson, Katherine Helmond, Ian Holm, Michael Palin, Peter Vaughn and David Warner. Shahram Amiri was an Iranian nuclear scientist of Kurdish descent who disappeared from Iran during 2009–2010 under disputed circumstances, and was finally executed by Iranian government in August 2016. Christopher Arthur Amon, was a New Zealand motor racing driver. He was active in Formula One racing in the 1960s and 1970s and is widely regarded as one of the best F1 drivers never to win a championship Grand Prix. His reputation for bad luck was such that fellow driver Mario Andretti once joked that "if he became an undertaker, people would stop dying". Former Ferrari Technical Director Mauro Forghieri stated that Amon was "by far the best test driver I have ever worked with. He had all the qualities to be a World Champion but bad luck just wouldn't let him be". Mansueto Bianchi was an Italian Roman Catholic bishop. Jean Antone was an American professional wrestler. After debuting in 1961, she worked a series of mixed tag team matches with partner Terry Funk. In the early 1970s, she went to Japan to work for All Japan Women's Pro-Wrestling. While part of the company, she held the WWWA World Single Championship once and the WWWA World Tag Team Championship twice with partner Sandy Parker. Back in the United States, she wrestled in Oregon's first women's match in over 50 years in 1975. The American Wrestling Association (AWA) was an American professional wrestling promotion based in Minneapolis, Minnesota that ran from 1960 to 1991. It was owned and founded by Verne Gagne and Wally Karbo. The territory was originally part of the National Wrestling Alliance (NWA), becoming an independent territory in the late 1950s. All Japan Women's Pro-Wrestling, nicknamed Zenjo was a joshi puroresu promotion established in 1968 by Takashi Matsunaga and his brothers. The group held their first card on June 4 of that year. For many years, it had a TV program on Fuji TV. Hans-Jürgen Appelrath was a professor of computer science and information technology (IT) at the University of Oldenburg since 1987. The Carl von Ossietzky University of Oldenburg is a university located in Oldenburg, Germany. It is one of the most important and highly regarded educational facilities in northwestern Germany and specialises in interdisciplinary & sustainable development studies and renewable energy studies with focus on solar and wind energy. David Attwooll was a British poet and publisher. He also played drums, performing in an early incarnation of the avant-rock group Henry Cow. Józef Szymański, 90, Polish Olympic bobsledder. The following is a list of notable deaths in May 2017. ↑ "Jackie Fox". Archived from the original on 22 June 2017. Retrieved 8 September 2016. ↑ Shakira was never slave to her disease. ↑ Craven Clark Rogers Jr.
↑ "Bulgarian actor Nikola Anastasov dies aged 84". Archived from the original on 21 August 2016. Retrieved 8 September 2016. ↑ "Former Tamil Nadu minister Sarguna Pandian dies aged 75". Archived from the original on 26 August 2016. Retrieved 8 September 2016. ↑ Bishop Jorge García Isaza, C.M. ↑ "William Landles : Obituary". Archived from the original on 18 September 2016. Retrieved 20 September 2016. ↑ A murit Adrian Enescu, compozitorul piesei "Buna seara, iubite!" ↑ "Joseph Chilto Pearce". Archived from the original on 23 September 2016. Retrieved 23 September 2016. ↑ "Former Harford, Cecil Counties Delegate B. Daniel Riley dies at 70". Archived from the original on 11 September 2016. Retrieved 8 September 2016. ↑ Well-known archaeologist David Trump, who led some of the finest explorations in Malta, has died at the age of 85.